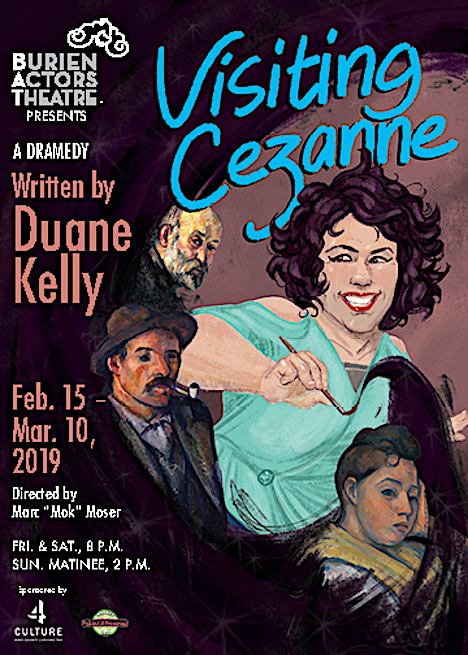 Burien Actors Theatre’s (“BAT”) production of the comedy-drama Visiting Cezanne is a funny and inspiring look at artists--and how we find our way, and ourselves, when all seems lost. Performances of this new play, which premiered in 2018, runs Feb. 15 through March 10. The magic in a paintbrush whisks unknown painter Nora Baker from 2016 New York back to 1900 France and the studio of Paul Cezanne. Nora, Cezanne and the play's other characters explore what keeps an artist, or any of us, going when it all seems hopeless. Will this magical meeting change history? Heart and humor infuse this clever look at finding ourselves and our purpose. This show contains infrequent adult language that includes "G, D, S and a couple of F words.” BAT's policy is to inform audiences of content but to let parents, guardians and teachers make decisions that they feel are appropriate for the youth and teens in their care. Performances are Fridays and Saturdays at 8 p.m., and Sunday matinees at 2 p.m. at Burien Actors Theatre, 14501 4th Ave. S.W. in Burien.